Happy HoliDogs and to All a Good Dog. It’s been reported to THE NEW BARKER that family dogs in Florida have willed on this unseasonably cold weather we’re having. The reason? So they can sleep in bed with their humans, of course. And the dogs are winning. 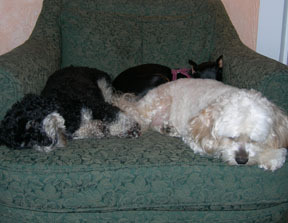 More than ever, people have been making exceptions to their house rules, and are allowing dogs up on their beds. What is going to happen when the weather warms up? THE NEW BARKER predicts dog trainers will be very busy in March. ‘Twas the night before Christmas in Downtown Sarasota. Many creatures were stirring, humans and dogs taking walks. Knowing Cafe Americana diners soon would be there. A Harley-Davidson bike with sidecar and five tiny dogs. And what a sight. 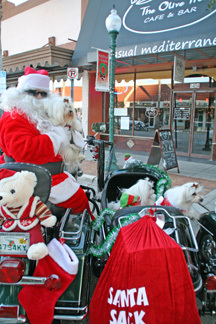 Dan and Mari were dressed as Mr. and Mrs. Claus and their Maltese Bikers were dressed as little furry elves. You Let Those Dogs Out. If Sunday, December 26 was any indication, dogs and their humans have cabin fever and are ready to get outdoors. Despite the cold temperatures and wind gusts, there was a really nice crowd at Florida Botanical Gardens in Largo for the Annual Holiday Lights Dog Parade. The Holiday Lights spectacle continues through January 2, and dogs are allowed to stroll through the gardens along with their humans. Speaking of getting out – this is the week to catch some great buys for dog supplies. We hear that Downtown Dogs in Hyde Park is the go-to place for Gasparilla Pirate Gear for dogs. Get that gear and book a Pet Pirate photo session with photographer Nicole Geller. You’ll be registered to win a chance to ride on a Gasparilla Parade float with your dog. Too cool for words. And to keep the Christmas spirit burning bright, check out the fabulously festive dog boutique, Pawsitively Posh Pooch on 4th Street in St. Pete. In fact, make a day of it and visit One Lucky Dog, just down the street for some special goodies. Then hop on over to Pet Food Warehouse to check out their newly expanded store and beautiful cat room featuring adoptables from Save Our Strays. Getting hunger pangs? Visit dog-friendly restaurant El Cap on 4th Street in St. Pete for a delicious burger and fries. Looking for unique breed specific gift ideas for that hard-to-buy-for human on your list? You have to check out Paw Paws in Countryside Mall/Clearwater. They have more than 50 different breed specific items. Want to stock up on some pretty dog-themed tree ornaments? Visit Fluffy Puppies Dog Boutique in Clearwater with more than 2500 square feet of total dog fun. Then step across the street for a respite of delicious dessert and gourmet tea at Wildflower Cafe. If you’re lucky enough to be visiting St. Pete Beach, check out the shops on historic Corey Avenue. Say hello to Max, the store dog at Gone to the Dogs and delight in some one-of-a-kind dog bowls, treat jars and toys. The weather should start to warm up a bit for the weekend and that’s good news. Dog-friendly events will start to heat up too. On New Year’s Eve in Key West, it’s the Sixth Annual Key West Dachshund Walk at noon, just for the fun of it. In West Palm Beach, December 31 through January 1, the Tailwaggers AKC Agility Trials take place at the Jim Brandon Equestrian Center. Our fave band, The Yard Dogs, will be playing at the Ft. Myers Beach Moose Lodge on January 1 for the 6th Annual Hair of the Dog Party. 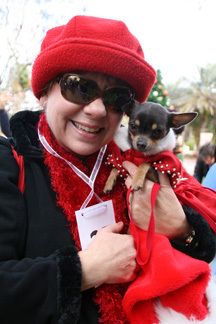 The monthly Pets on the Patio at Gaspar’s Grotto in Ybor City has been moved to January 8. Looking for a little culture and comedy? Ventriloquist Todd Oliver brings his band of merry dogs to The Lakeland Center on Sunday, January 9 for a show at 3pm. Come see Lucy, Elvis and Irving in a hilarious stage production of talking dogs. What, you’ve never heard a dog talk? Then, you’re in for a real treat. Learn what your dogs are saying about you behind your back. Tickets are on sale now and $4.00 of each ticket sold will benefit the SPCA in Lakeland. If you’re lucky enough to go, please remember to bring along an unopened can or bag of dog food for the shelter. More events are on the near horizon, including the annual Florida Classic Clusters, an incredible two-week AKC-sanctioned January event in Hernando County. Be sure to mark your calendars for the March 5 Bark in the Park event. The Humane Society of Tampa Bay, Florida Boxer Rescue, Fletcher’s Harley-Davidson and THE NEW BARKER are bringing all members of the RESCUE INK team to the Bay Area for the Humane Highway Tour. As always, stay Pup-to-Date on the latest dog-friendly events by signing up for PupDates. See you around, dog fans. And remember: Please Dog Responsibly. 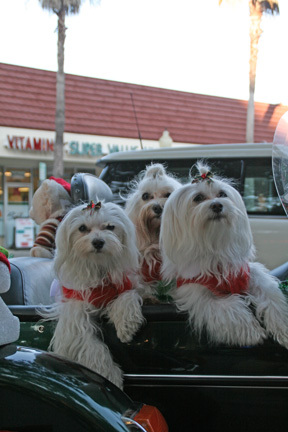 Just wondering if it’s possible to get copies of the photos that were taken of my Maltese in Sarasota. They are the ones that were helping Santa. Thank you. new barker is a great publication. Previous Previous post: Just In The Nick Of Time. Next Next post: Dogs and People Living Together.